“Never, ever, ever, ever give-up.” [a Winston Churchill paraphrase I believe…as I’m sure many others have mentioned this through out history]. I think about this type of quote often and use it as a mantra as much as possible. 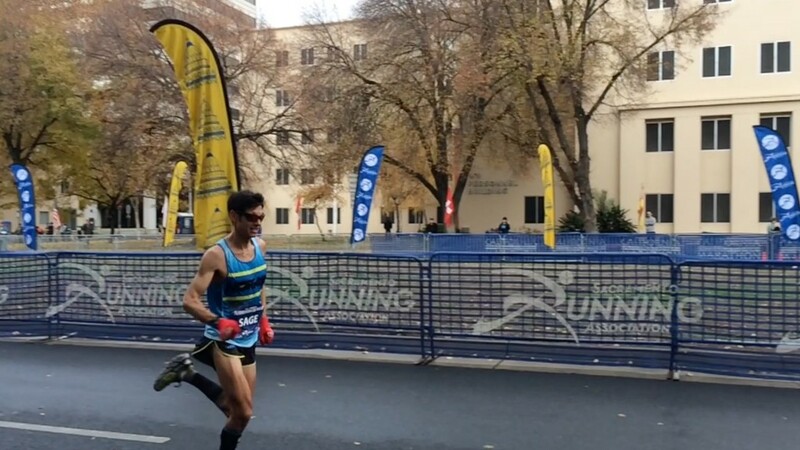 As many of you may already know I just ran a rather horrid positive split, 2:19:52 Marathon at the California International marathon and missed my goal of a sub 2:18:00 time and a ticket to enter the most prestigious US marathon one can enter: The US Olympic Marathon Trials race. A slow finish after a rather quick 1:08:23 first half. I was still a little ahead of pace at mile 20 (1:44), but at mile 22 I pushed myself into the wall and hit it hard! Since qualifying for the trials in 2008 and 2012 I want to keep my “streak” alive and even gave up racing many lucrative ultras to pursue this ever challenging goal. Why? Well, first of all the Olympic Trials only happen once every 4 years. It is a very special race that is near and dear to my heart. It is also a huge challenge for a “slow” MUT Runner like me. Despite having a 2:16:52 marathon PR from 2011, I’ve struggled to hit the 5:15/mile pace required to run a sub 2:18:00 in the past few years. But ultimately I also think that road marathon training intensity can help one achieve their potential in MUT Running as well…in the long term. 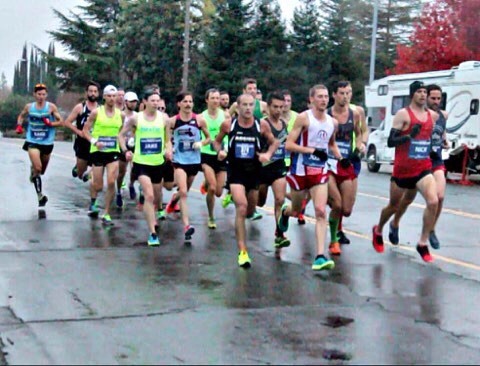 Training the lactate threshold, doing speed sessions and optimizing running economy can translate in dividends to races beyond 26.2…even races up and down mountains! Then at UTMB (a huge focus of my whole summer) I managed to clumsily fall and take myself out of the event. I re-think over and over “what would have [could have] happened” if I didn’t fall? Would I have done well in my first 100-miler? Who knows…I don’t think anyone was going to be close to beating Xaivier that day though. I started the year in February with a dismal 2:20:02 at the LA Marathon where I placed 8th in the USATF National Championships. The course was not lightning fast, and it was on the warmer side, but basically I came out flat and my legs were stuck at 5:20/mile pace the whole time. It was a disappointment, but I was able to re-group and focus again on my next race: The Boston Marathon 5 weeks later. Boston, honestly was probably the best run marathon race of my entire career. I think it was a better performance than my 2:16:52 PR. Unfortunately a 10-15mph head-wind, along with a cold rain seemed to yield rather slow times. I only ran a 2:19:12, but was able to nab a 16th place finish (a place that usually is around 2:15-2:16 given the quality of the field at Boston). I executed well and trained optimally for that marathon! The Speedgoat 50km again was a bright side to 2015 for me as I essentially ran the same as my CR time (on the same extended course since it was changed in 2014) and felt really dialed doing high altitude mountain running. In my opinion, a course like Speedgoat is the epitome of US Mountain-Ultra trail running and it felt good to nail that one for the 3rd year in a row! My knee injury after UTMB set me back again as it took awhile for the pain in my knee to subside. Originally I was torn between trying to rush in a road marathon (Richmond) before the TNF50 SF, as I really wanted to do to defend my title on the trails. However, I ultimately decided to “be patient” and put all my stock in Cal International (unfortunately the same weekend as TNF50). In retrospect (oh the benefit of hindsight!) that might have been a mistake as it may have lead to me to overtraining a tiny bit: I raced the Big Sur half marathon as a “tune-up” to focus on my speed and then crushed a few workouts just about 5-10sec/mile faster than I probably should have run them. 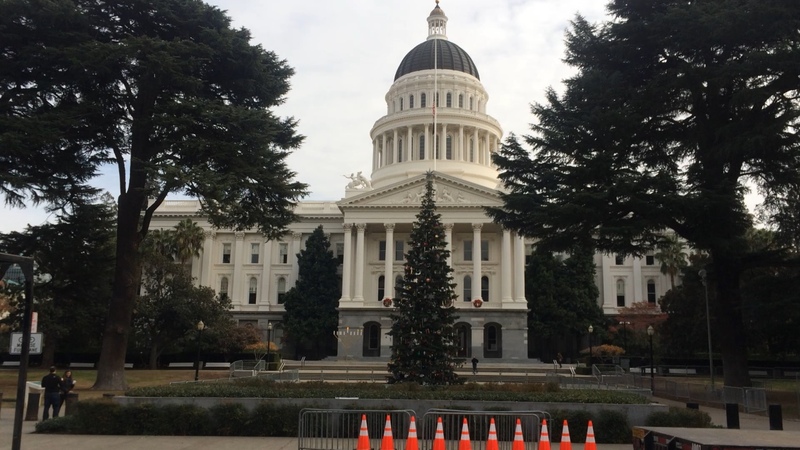 Instead of logging another 120 mile week and another steady 23-mile Long Run like I probably should have, I tapered for that half marathon and focused more on “leg turn-over” as that had seemingly been my weakness at LA and Boston. However (and I’ll be looking over my Strava Training log again and again for this), sometimes when you coach yourself you have this horrible bias where you fail to see the big picture. Based on how crappy my legs felt early on at CIM and how I struggled to hold pace for a sub 2:18, I really only have myself to blame. It’s a tough pill to swallow and a hard mistake to admit as a coach…but my training may have been a bit off. It is much better to be 10% undertrained than 1% overtrained (and I’ve learned this the hard way over the years). Sometimes I feel as though I am banging my head against a wall, repeating the same “mistakes” and frustrations over and over…the definition of stupidity. Ultimately there is joy in the struggle though…it’s how I can find flow. If we ran great races all the time and won and everything came easy it would be a pretty boring life. A little adversity builds character here and there and honestly I have nothing in my life to complain about! This process is a privilege to be able to experience…this journey of running on any surface and at any distance. I have the luxury of being able to even attempt and train for these crazy races. This is a dream come-true already. Sandi (my main support!) 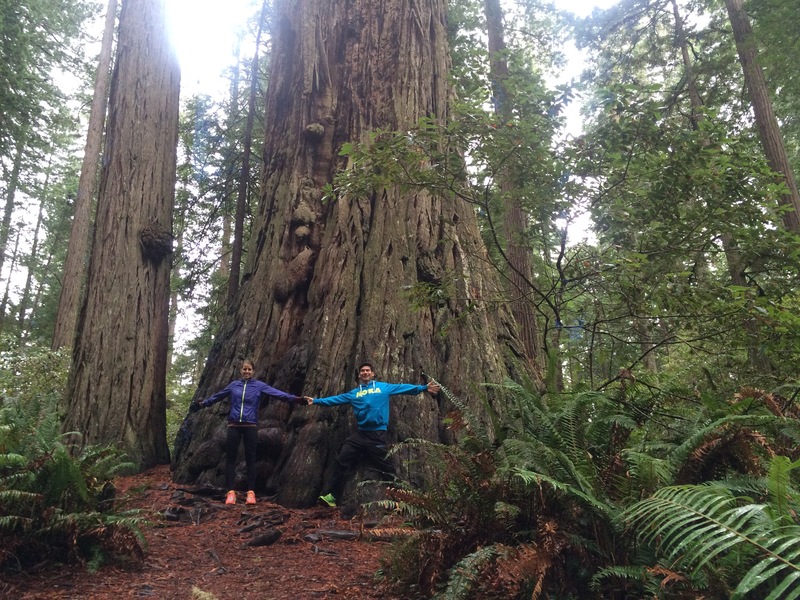 and I made a visit to the Redwoods after the race! Have a great holiday season, thanks for the support, and I wish you the best in pursuing your goals heading into 2016 and beyond! Socks: Drymax Max Protection….soon to be a “SAGE” design for 2016! sage, you are still the man to watch! even in your self-described ‘down’ years you inspire us all to reach for bigger and better goals. thanks for that! Thanks so much for your awesome support Patrick! I am Japanese and so proud of you and your greatuncle, Min Yasui. I didn’t know about him and the stories about the Japanese immigrants in Oregon. I hope the project will be made into a film soon. And I wish you good luck with your next race. Never give up ! Hi Iki. That is very awesome to hear. My great uncle was very inspiring and had a strong work ethic. Thanks again for your support! your youtube channel helps us alot to understand every time more and more about MUT. For those that are new in the activity, and for the old ones that still have something to learn. Thanks for your support as always, Max! I really appreciate it! Your actions and words are so motivating, I hope you crush the Houston Marathon Sage. Thanks for all your YT content and sage advice (it couldn’t be helped haha), and I am certain you will toe the line in LA. Thanks so much Steve! Glad you like the youtube videos as well! 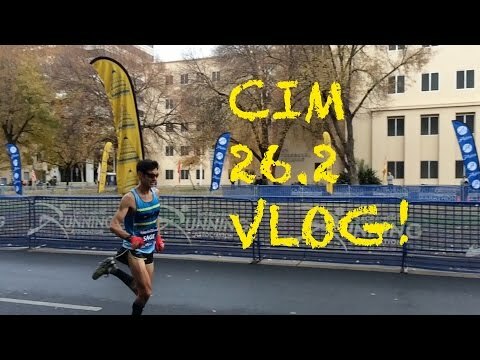 I ran 5 marathons (including Boston and CIM) this year to meet a time goal. It’s inspiring to see you keep trying, and helps me keep at it. Thanks for the support Robert! Yeah, it’s a grind sometimes! Wow! They changed the time standard? Well, then YOU WILL ROCK IT, SAGE!!!!!! Woot woot!!!! You are ALMOST THERE! Just ONE MORE MONTH and your dream will be HERE! Thank you so much for your support! I’ll go for it! I know you have a very high standards for yourself, I would not that that you had a terrible year. BTW, do you carry those 4 V-fuel gels with you during the marathon, or take from the feed zones? Thanks! Yeah it could have been much worse. I’ve been fortunate. I just didn’t race enough ultras and get out on the trails as much as I probably should have. I’m lucky because in these races I get special “elite” fluid bottles on tables they set up…I tape the Vfuel gels to my bottles and grab them along the course. In the past I’ve carried gels in my shorts pockets though. Really enjoyed reading this Sage. What was the reasoning behind the USATF change? Thanks for your support! For some reason the Olympic standard changed up from about 2:17 to 2:19:00. The USATF decided that the Trials standard couldn’t be faster than the Olympic standard so they matched it! Sage, thank you for being introspective and sharing your thoughts. I hate to think that setbacks in competing are inevitable, but I’m convinced that being resilient to come back and succeed after a setback makes our sport incredibly special. This past year I focused a lot on road half-marathons and bonked in my A-race in September, but two weeks later I bounced back by exceeding my expectations in a mountain trail race and I was really inspired after that. Next month, I’m aiming for redemption. When you’re facing an A-race, do you get nervous? How do you cope with the nerves a week out from competition? Good luck next month! Great to hear Dwight! I always get nervous..but I think that just means I care a lot and it helps bring out the best physical effort. Good luck with your future races as well! Never give up…Go Sage Go!!! You got this Sage! I will be looking up at the results on the 17th, and will see your name with a sub-2:19! Let’s go!